I have joined the CSM family woot. To bad i'm a fatass that can't fit the belt lol. While I do not like the series totally it does get better I do love the concept and designs of the series. Also really like the belt. So we should be seeing the first Arcle reviews in the next few days. And the CSM blog posted a few details, including the first look at the instruction manual design and the fact that it includes foam blocks to put on the two armor parts that you have to stick on yourself. Probably to both hold it in place since it attaches magnetically, and to keep it from shifting and scuffing the belt. Also, a happy birthday to the character Godai Yusuke, 3/18 is his canonical birthday. Bit disappointed that they didn't hide the LEDs in a better way to give more consistent light without those small bright spots. And the phone seems to be just and afterthought and a way to cram this trademark feature of 100+ phrases you don't really need or care for. It doesn't have on/off button, the plastic used for the case looks kinda cheap, it would probably make sense to buy a real thing for cosplay (which actually makes me wonder, what was the brand of the original phone). Other than that, no complaints. Can't wait to get mine in June. Next release will be announced on... April 1st? And an April Fools joke. Yikes... most expensive CSM to date. So which one of y’all gonna buy it? Lol! Possible hints towards the real next CSM hidden in the joke teaser. All these signs together point to the announcement of a CSM Delta Gear coming tomorrow. 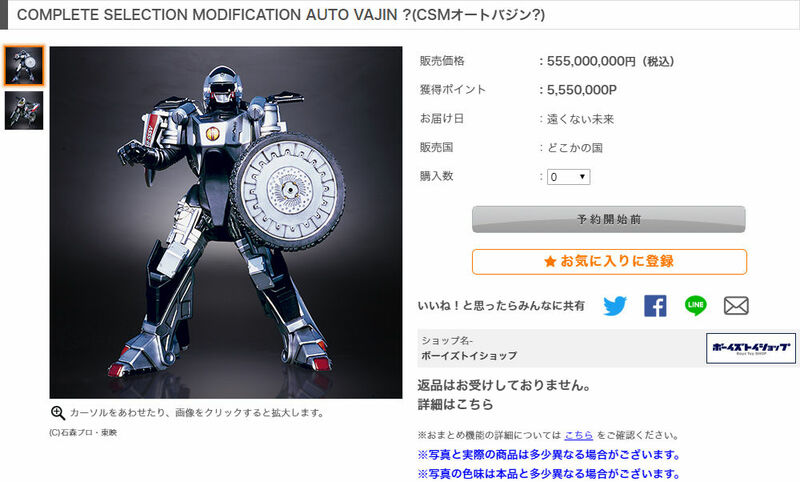 CSM Auto Vajin… if only! Good call on the possible Delta Driver reveal though, RiderFan. I think there's a good chance. One of the few times when they complete the main Kamen riders in csm. To get Delta or not to get Delta that is now hte question. I'm leaning into getting it but might not. Great. Now try getting one of those Delta Boxes just like in the show. So, evidently, the Delta Gear came out first in the recent Twitter poll. I couldn't be happier. Seriously, I was okay with just having the Faiz Gear, but since they released Kaixa, you really can't not have Delta too to round out the trio of belts. - "3 - 8 - 2 - 1". - Lights (with projection function) in the barrel. - Buttons in the Delta Mover that play voice clips/BGM. - A possible working camcorder screen of some kind? - Light-up belt with wireless communication. I would also assume that just like with the CSM Faiz and Kaixa Gears, the CSM Delta Gear would also be upsized as well. Well... you don't want to know what this cost me. Unlike the Faiz and Kaixa cases, the case used as the base for the Delta Gear is no longer in production. Wish I had enough money to waste on one of these. CSM Delta Gear details revealed. Price set at 27,000 yen and a release in September. Includes a sound control system, similar to the artisan Megaranger items I’m assuming. Controls for the transformation, attacks, and number code combinations. Delta Phone has a catchphrase button with sounds from the two main Deltas, Mihara and the Dragon Orphnock. Plus a BGM button with 5 different songs, unfortunately “Delta Strip white ring” isn’t one of them. The Delta Mover has a light in it that will project the Delta mark when doing the finisher. And the Delta Phone will wirelessly communicate with the belt and make the buckle light up when you do the exceed charge. So, 5.5/7 right I’d say, with the voice/BGM buttons on the phone rather than the mover, and without the working camcorder. Still no confirmation on the size, but I’m assuming you’re right about it being scaled up to match the others, that would explain the price being a bit higher than most people expected. Just noticed something on the item page. It says the size of the mission memory is 32mm x 60mm, that’s the same scale as the other Faiz CSMs, meaning that they did indeed size up the Delta Gear to 1/1 scale in order to match with the other releases. That’s why the price is a little higher than some predicted, it’s a whole new larger mold. Last edited by RiderFan18; April 14th, 2019 at 08:26 PM. I did not think they would add the other codes for Jet Slinger. This means that it's going to be a legit voice recognition system as opposed to the DX's sound/vibration input system. It would be interesting to see how accurate their voice recognition technology will be, though I think it will work better for some than others. Also, how will they be able to differentiate a trigger pull for shooting versus when you want to input a code? Looking forward to testing it out. The character select + dehensin sounds are all a nice touch. I also like that they rotated the connection peg on the Mover 90 degrees so it latches on to the belt just like in the show where you have to rotate it to disengage it. Hopefully they'll include an upgraded phone with the CSM Faiz Blaster, though God knows when that's going to be announced and released. One year? Two? Though, if they do release a CSM Faiz Edge as well, that's pretty much everything from Faiz released in the CSM line.